Painful memories from long ago resurface when Emily Wells travels to Colorado to clean out her family’s vacation cabin for its new owner. Strongest among them? Her recollections of Logan Chase, Emily’s first love, to whom she gave her heart one magical summer, only to have it broken when she never heard from him again. Logan had never forgotten that summer romance and can’t believe it when he finds Emily packing up the little cabin that he has recently purchased for renovation. 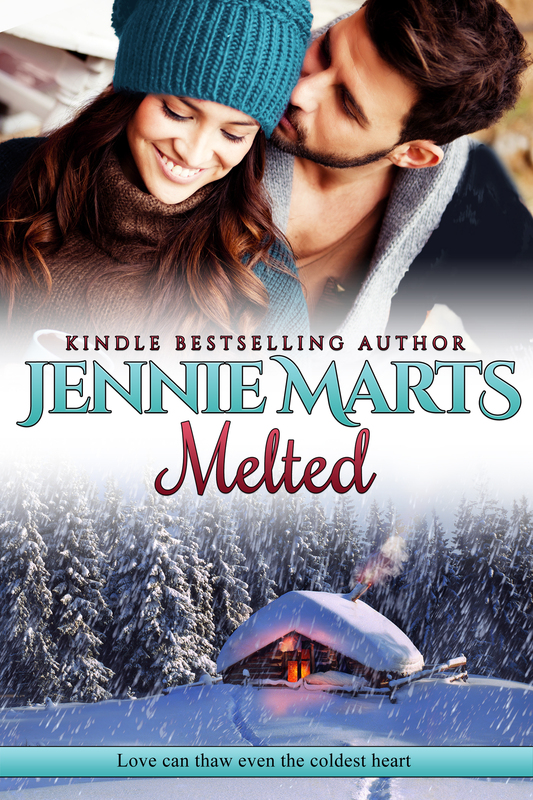 Despite the passage of years and their stormy history, Emily and Logan can’t deny the fierce attraction that still sizzles between them…Will one snowy night together be enough to melt her frozen heart and give them both a second chance at love? Hey!” He grabbed her around the middle in a playful tackle and rolled on top of her. She shrieked in laughter, throwing snow and bucking against him. He pinned her, breathing hard, and grinned down at her. Snowflakes stuck to his ridiculously long, dark eyelashes, and her breath caught as she looked up into his eyes. He’d only grown more gorgeous with age. Looking at him caused her chest to actually hurt. She’d missed him so damn much. The laughter in his eyes changed to something different. Something darker as he looked down at her lips. She sucked in her bottom lip and watched his blue eyes deepen further still. He leaned down, his mouth achingly close to hers. She could feel the warmth of his breath against her cheek and the delicious weight of his body as he lowered himself onto hers. What was she doing? She hadn’t seen Logan in years. He might be a totally different person than she remembered him to be. He could have turned into a total a-hole. Or worse, he could still be the same sweet Logan that had held her hand and taught her how to shoot pool. Would his lips feel familiar? Would he taste the same? Her heart pounded against her chest, and she knew her hands were trembling. She reached up and laid her hand against his cheek. He closed his eyes and turned his face toward her hand, softly laying a kiss against her palm. She sucked in her breath, her lips aching in anticipation. He opened his eyes and looked into hers. Looked into her very soul. Then he leaned down and took her mouth in his. He didn’t just kiss her, he possessed her lips with a passion that sizzled all the way to her toes. His kisses were hungry, greedy, as if he were starving, and she was his last meal. His right hand tangled in her hair while his left held her face, cupping her cheek in a tender grasp. Her body burned, and she arched against him, pressing closer as she wrapped her arms around his back and held on. His back was strong. She could feel his muscles tense even through his coat. They were putting out so much heat that she was surprised the snow hadn’t melted in a circle around them. Suddenly he pulled back, his breath now coming in hard gasps. “Wait. I’m so sorry. We can’t do this.” He pushed up and leaned back on the snow. She writes from the mountains of Colorado where she lives with her husband, two sons, a golden retriever named Cooper and a Sheltie puppy named Maggie. Jennie enjoys being a member of Romance Writers of America (RWA), Colorado Indie Authors, and Pikes Peak Writers. Jennie is addicted to Diet Coke and adores Cheetos. She loves playing volleyball and believes you can’t have too many books, shoes or friends. Jennie Marts is giving away two eBook Copies of Another Saturday Night and I Ain’t Got No Body. For your chance to win, please enter the rafflecopter below.